SAFE Structure Designs, a global leader in the design, engineering and manufacturing of ergonomic safety first aircraft maintenance stands, fall protection platforms, hangar equipment, portable field equipment and specialty tooling, announced today the delivery of customized hangar equipment to the Army National Guard in New Mexico for their fleet of UH-72 Lakota / EC145. 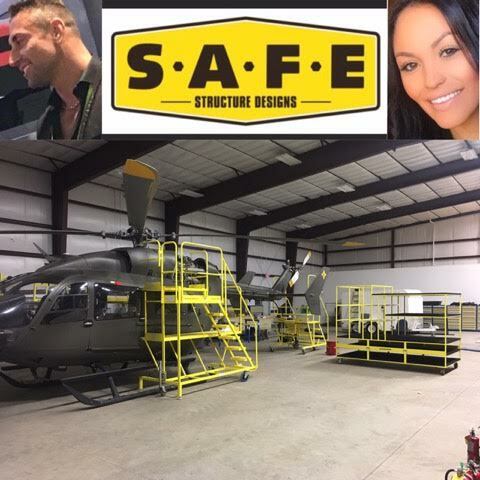 Utilizing SAFE Structure’s well seasoned design and engineer team of ergonomic specialists along with feedback from their valued client, the Army National Guard, SAFE Structure completed a full line of maintenance support equipment to accommodate the UH-72 Lakota / EC-145 aircraft. The full line of maintenance support equipment includes a set of maintenance stands, cowling racks and blade racks. The ergonomic safety maintenance stands provide the highest level of safe access to the hydraulics and avionics as well as the engines, transmission, main rotor, exhaust sections, tail boom and tail rotor. The extended and contoured decks allow multiple mechanics to work in separate areas of the aircraft while utilizing the same maintenance stand. SAFEstructureDesigns provides high quality maintenance stands to the aviation industry. We specialize in the innovative design and manufacturing of ergonomic safety first aircraft maintenance stands, maintenance support equipment and hangar equipment for all Helicopter applications, and focus on working with customers to design customized products that enhance and improve aircraft maintenance. SAFE Structure is an innovator in the production of quality safety first ergonomic aircraft maintenance stands, improving safety and enhancing maintenance effectiveness. SAFE Structure’s custom safety first aircraft maintenance stands; maintenance support equipment and hangar equipment are sought after and tested by aircraft mechanics worldwide. SAFE Structure Designs is a global leader in safety first maintenance technology.